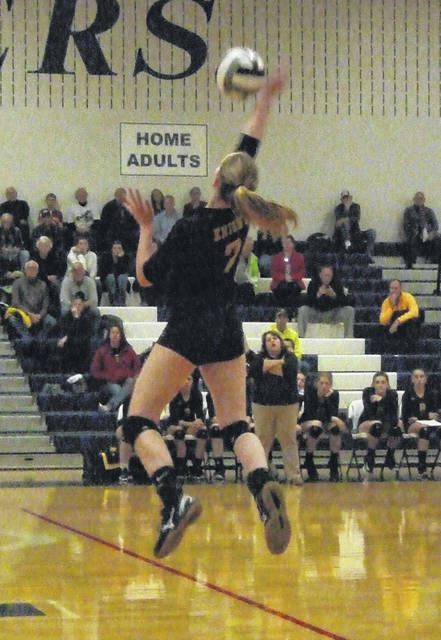 Northmor’s Hanna Bentley reaches up for a hit in her team’s regional semifinal match with Tinora Thursday night. 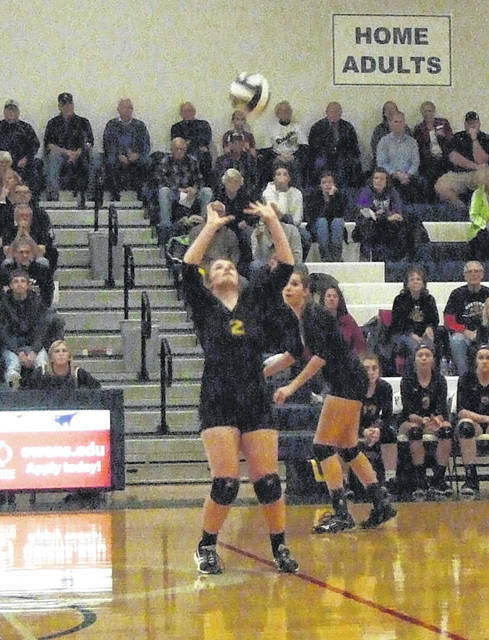 Lily Tate sets the ball for Northmor in Wednesday’s regional semifinal volleyball match. Northmor volleyball’s most successful season came to an end Thursday night at Millbury Lake High School in the regional semifinals. Competed against state-ranked and undefeated Tinora, the Knights fell by scores of 25-15, 25-18 and 25-22 to end their season with a 20-6 mark. Both of the first two sets played out in much the same way, with Tinora jumping out to a big lead early on and holding on for the win, while Northmor struggled to tally points off their serve. In the first game, three points from Hannah Horn, two from Baylee Rex and four from Aubrey Reineke helped boost the Rams to a 15-5 lead. While Aly Blunk and Lily Tate both scored points for Northmor, they still trailed 19-8 after a pair of points were served by Horn. Northmor would get within a 20-13 margin thanks to three points from Anna Donner, but the team wouldn’t get any closer in the game, as they fell by a nine-point margin. The second set was opened by Horn scoring for four quick points to stake the Rams to an early lead. Trailing 11-5, the Knights got three points from Blunk to cut their deficit in half, but then went without offensive points over their next four service attempts. When Abby Donner broke that drought with a point, the team trailed by a 20-14 margin and would eventually fall 25-18. Facing elimination in the third set, Northmor put forth their best showing of the night. Trailing 8-7, the team got four points from Tate to take an 11-8 lead. Tinora immediately bounced back with a defensive point followed by three from Tori Morlock to take a one point lead, but Northmor had an answer when they scored on defense and got a score from Macy Miracle to lead 13-12. Two points from Hanna Bentley gave the Knights a 16-13 advantage, but they would not be able to score off their serve again in the game. While the team played solid on defense, the handful of points they did surrender would prove costly, as two points from Rex tied the score at 18 and one from Morlock gave the Rams a 21-20 lead. Then, holding a 22-21 advantage, the team got two from Horn. Northmor got a defensive stop to stay alive at 24-22, but would not score on their next serve attempt to give Tinora match point. Wright noted that her team’s seniors (Tate, Bentley, Blunk and Anna Donner) played a huge role in the program’s recent success. Bentley finished with two blocks and one ace; Donner tallied one block, nine kills, 10 digs and five assists; Tate had one block and eight assists and Blunk had 10 digs in their final match with the Knights. Also, Leslie Brubaker had two blocks and eight kills; Miracle contributed one block, nine kills and 11 assists and Julianne Kincaid added four kills. The coach added that the past week has been a memorable one for the school’s athletic program. Not only did the volleyball team advance to its first regional appearance, but the football team is playing in its second ever playoff game (first at home) and the girls’ cross country squad also qualified for the state meet.